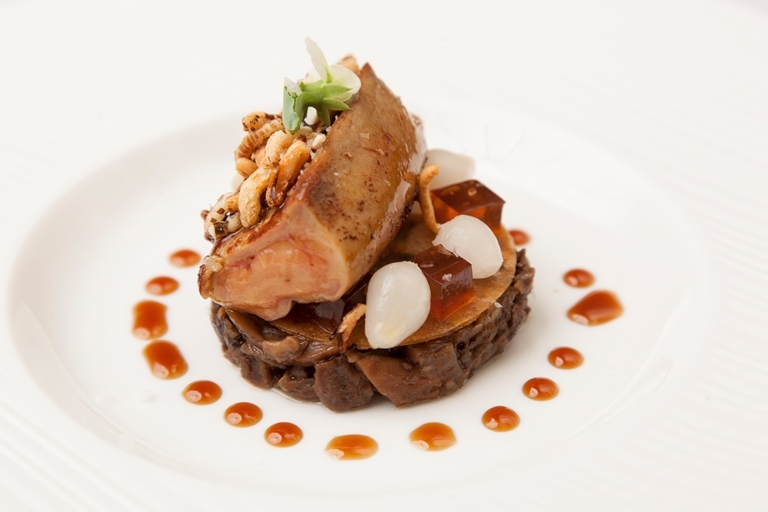 In this impressive starter recipe Colin McGurran cooks foie gras in a water bath before sautéing over a high heat to finish, resulting in a gloriously tender texture with a delicate centre and a caramelised outer edge. Pickled onions, silky mushroom duxelle and a punchy Amaretto jelly finish off the dish to perfection. Meanwhile, place the button mushrooms in a blender and pulse until coarsely chopped. Sweat the shallots and garlic in a saucepan until softened — but not coloured — then add the butter, Madeira, chopped mushrooms, thyme and salt and mix well.